Since very early on, it was simply 'known' that Finn would like skateboarding. It's Jeff's favourite hobby, his work, and the one thing in life that seems to trump most others. The thing that did surprise me a little though, was how much Finn would actually love it. If there is a board in the house, he will seek it out, pull it down and spin the wheels while squealing with delight. 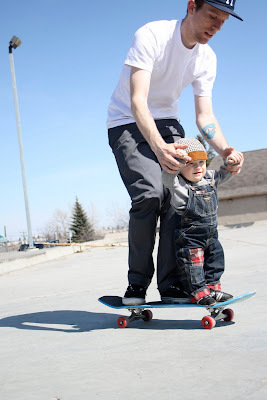 If there are new decks brought home, Finn wants nothing more than to slide them around, lay on them on his belly like hes surfing, and entertain himself for long periods of time swinging them all around the house. I have found him in the laundry room trying to get at boards still strapped to Jeff's backpack, followed him into the bedroom to find him digging in the closet to get at packages of wheels, and on more than several occasions, come out to see him pulling down his 'skateboarding shoes' from the shoe rack and trying his hardest to get them on his chubby little feet. 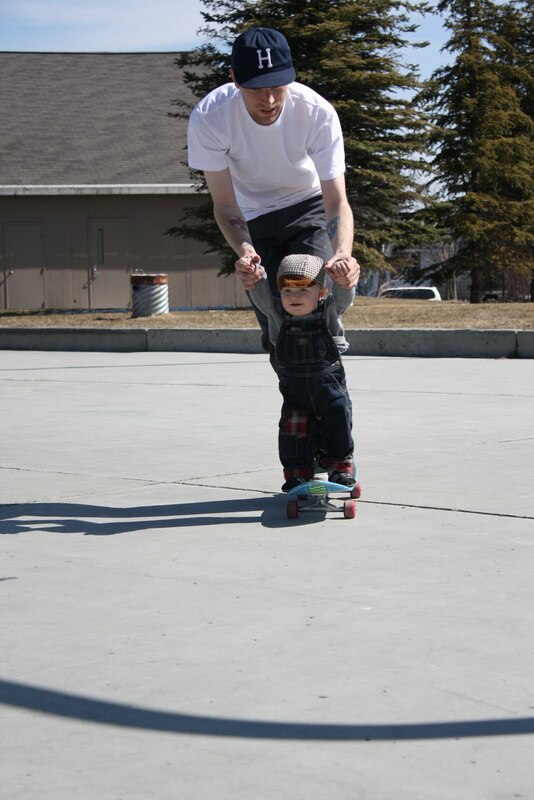 I hope this is something that he continues to love, something him and his papa can share for many years to come- the thought of them cruising around the neighbourhood together makes me smile. I guess that as with all things, only time will tell.